Martin Scorsese’s The Wolf Of Wall Street managed to squeeze pitch-black comedy from the worst excesses of the American capitalist system. And so, it seems only right that someone should use the trailer for Scorsese’s film to pay tribute to one of Hollywood’s original amoral, unscrupulous, comedic capitalist characters: Thurston Howell III. 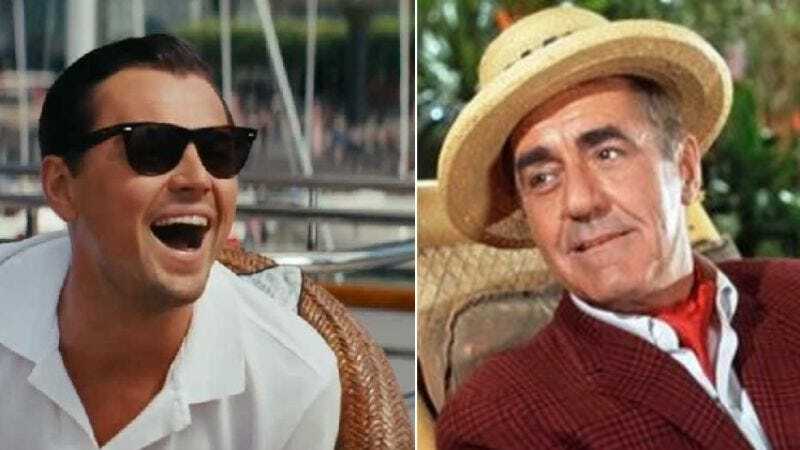 Hence, “The Wolf of Gilligan’s Island,” a remarkably well-crafted parody trailer that replaces Leonardo DiCaprio’s Jordan Belfort with Jim Backus as the legendary castaway millionaire (or billionaire, depending on which episode you’re watching). As Kanye West’s “Black Skinhead” pounds in the background, Howell mugs manically, throws cash around, and drawls aristocratic one-liners as only Backus could. Put together by editor vkmtvstudios, the video manages to match the shaky, rapidly accelerating rhythms of the original, throwing in crazy images—hostile cavemen, dancing communists, rampaging lions—from Gilligan’s Island that wouldn't have looked out of place in Scorsese’s film. And, just for comparison’s sake, here’s the trailer for The Wolf Of Wall Street.